Make crust: Put oven rack in middle position and preheat oven to 350°F. Wrap a sheet of foil over bottom of springform pan (in case of leaks). Lightly butter side of pan. Stir together ground wafers and butter in a bowl until combined, then pat mixture evenly onto bottom of pan and 1 1/2 inches up side. Bake until crust is slightly puffed, about 10 minutes, then cool completely in pan on a rack, about 15 minutes. Leave oven on. Make filling while crust cools: Melt chocolate and butter in a 2-quart heavy saucepan over low heat, stirring until smooth, then remove from heat and cool 5 minutes. Whisk together eggs, cream, sugar, salt, and vanilla in a bowl. Whisk chocolate mixture into egg mixture until combined well. Assemble and bake tart: Pour filling into cooled crust and rap pan once on counter to eliminate any air bubbles. Bake until filling 1 inch from edge is set and slightly puffed but center trembles slightly when pan is gently shaken, 20 to 25 minutes. (Center will continue to set as it cools.) Cool tart completely in pan on a rack, about 2 hours. Chill, uncovered, until center is firm, about 4 hours. Remove side of pan and sprinkle with cocoa to serve. 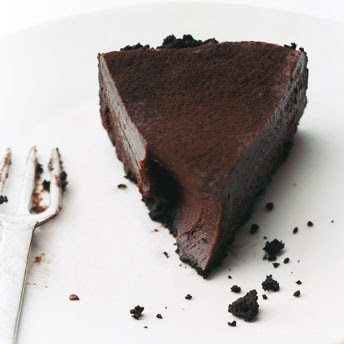 Cooks' notes: Tart can be chilled up to 3 days. Cover loosely after tart is completely chilled (covering before may cause condensation). Crust, without filling, can be made 1 day ahead and kept, covered, at room temperature.